A car bomb outside a church in eastern Baghdad has killed four people and injured 21, Iraqi police say. The bomb went off on Sunday evening and could be heard around the city. The attack was most deadly of six bombs which have hit Christian targets in Baghdad since Saturday evening. The bombs injured at least 10 people. There are some 750,000 people in Iraq's Christian community. Christian targets have been attacked in the past, but are spared much of Iraq's deadly violence. They have been targeted in some areas of the country, mainly in Baghdad and in the northern city of Mosul. However, most of the violence in Iraq is sectarian in nature and targets either Sunni or Shia Muslims. The worst attack took place near a church on Palestine Street, the Reuters news agency said. 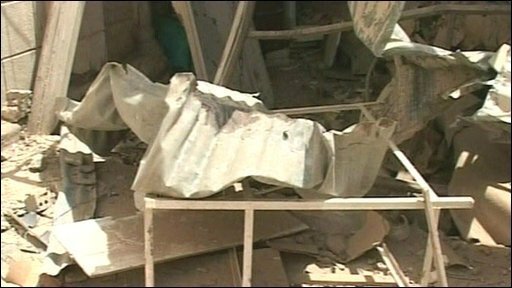 Most of the bombs detonated through Saturday night and Sunday were hidden in cardboard boxes, the BBC's Gabriel Gatehouse reports from Baghdad. One bomb caused seven injuries but no-one was killed, while two hurt no-one. A fifth bomb in the evening in southern Baghdad injured another three people. The attacks came on the day a senior general in Iraq's military said insurgent attacks could be expected to continue for several more years. Levels of violence have dipped sharply in recent years, but the remarks suggested Iraqi leaders are expecting continued sporadic attacks by militant cells after the US pulls out combat forces from Iraq by the end of 2011.